If you home has fire or smoke damage, this is the team that will give you back our peace of mind. Each trained and certified, our fire cleanup & restoration team is capable of making any fire damage in the Morganton area "Like it never even happened!" 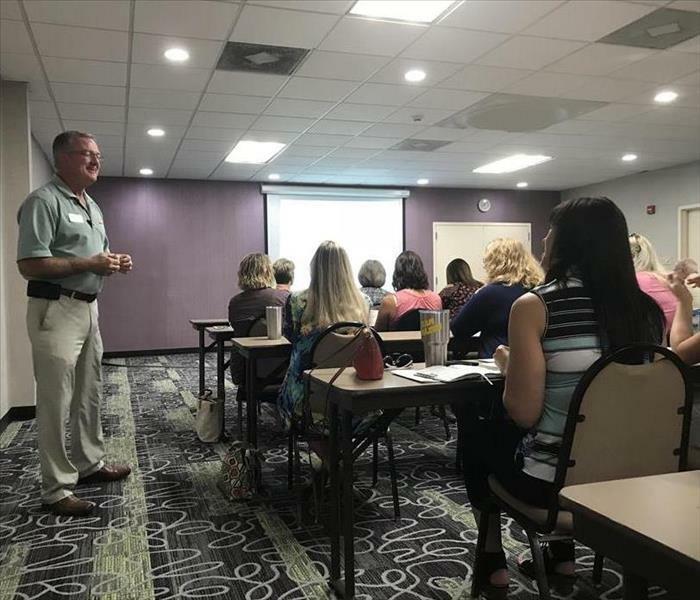 SERVPRO of Burke County regularly hosts Continuing Education courses as a way of supporting our local insurance agents and adjusters. In the above photo, Marketing Representative Mike Richey welcomes one such class! Our crew chiefs are highly trained and ready to respond to any size disaster! This was taken in one of our warehouses, which is fully stocked with powerful equipment to make it "Like it never even happened." 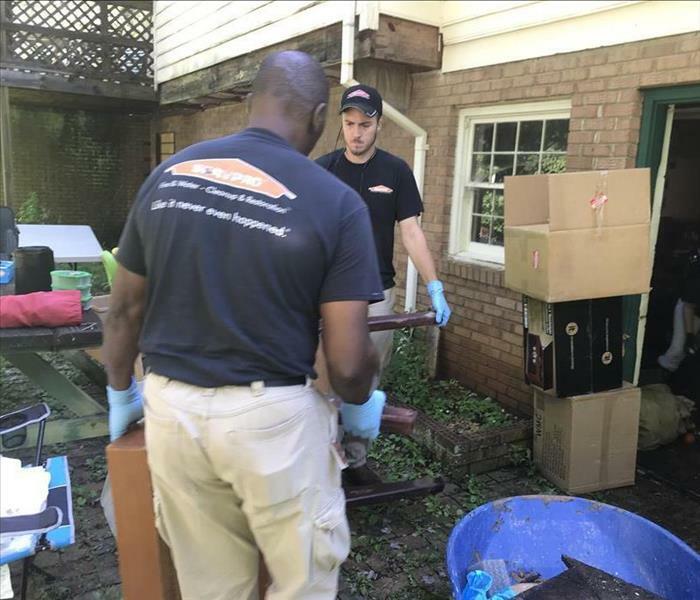 When disaster damages your property, our team at SERVPRO of Burke County comes in and packs out your affected possessions. Salvageable items are neatly packed and sent to our warehouse for cleaning and storage. Unsalvageable items--with the homeowner's explicit permission--are properly disposed of and documentation is prepared for insurance purposes. When our customers face mold, fire, or water damage, their clothes, rugs, and other textiles are often damaged. That's why we offer the opportunity to clean and restore those textiles. In the above photo, you can see just a small portion of our fully fitted textiles cleaning facility! 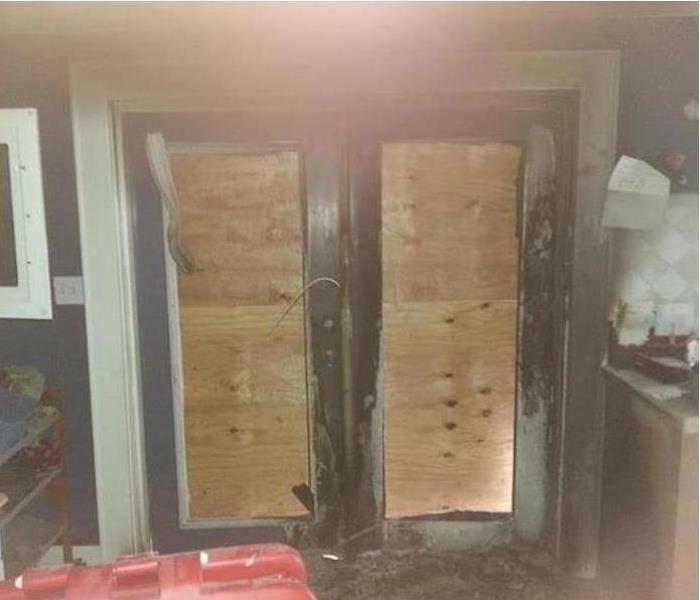 After a house fire began to damage this home in Morganton, NC, the local fire department quickly put it out, which caused water damage to some of the homeowner's possessions. Our packout team came and helped clean out the affected items. 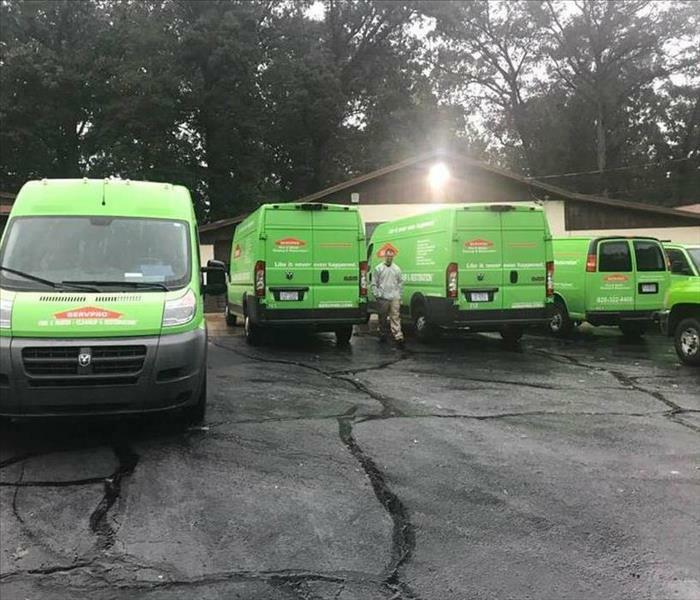 SERVPRO of Burke County sent out a response team to help with the recovery in Wilmington, NC after Hurricane Florence caused significant damage. In the above photo, our trucks are lined up and readied to be deployed. 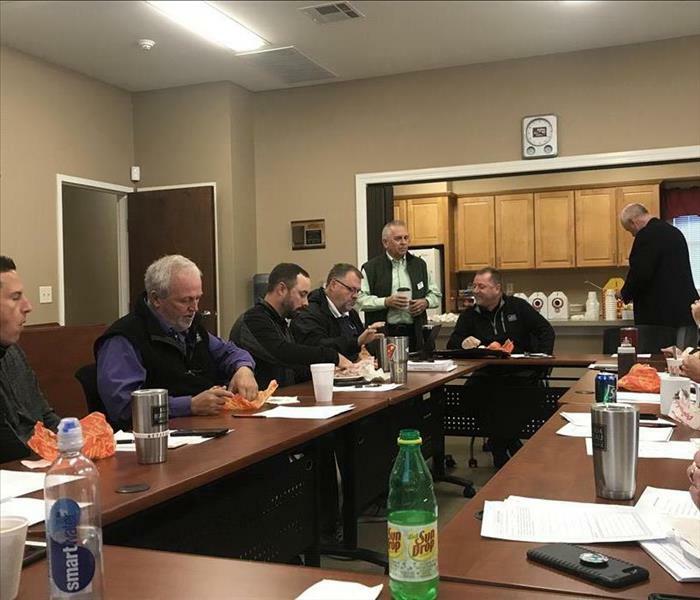 Marketing representative Mike Casey is involved in multiple organizations in Burke County on SERVPRO's behalf. In the above picture, he is with the president of the local Ruritan club for its 60th anniversary! 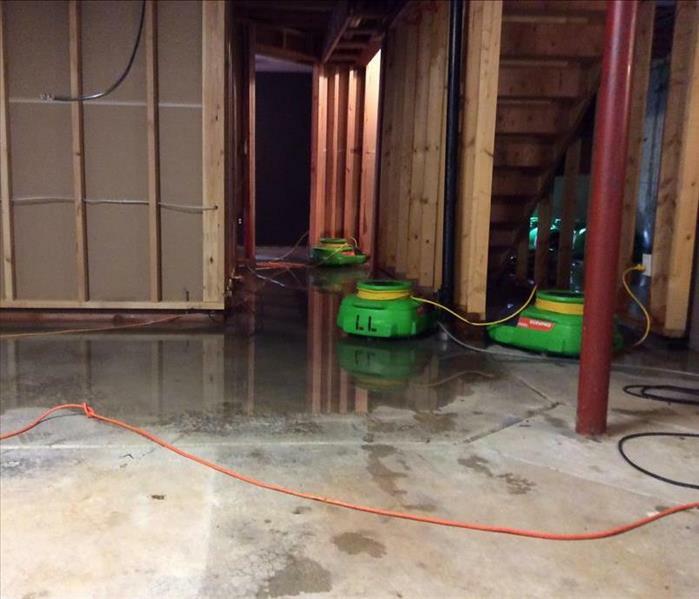 A local business recently suffered water damage, but SERVPRO was there to save the day. 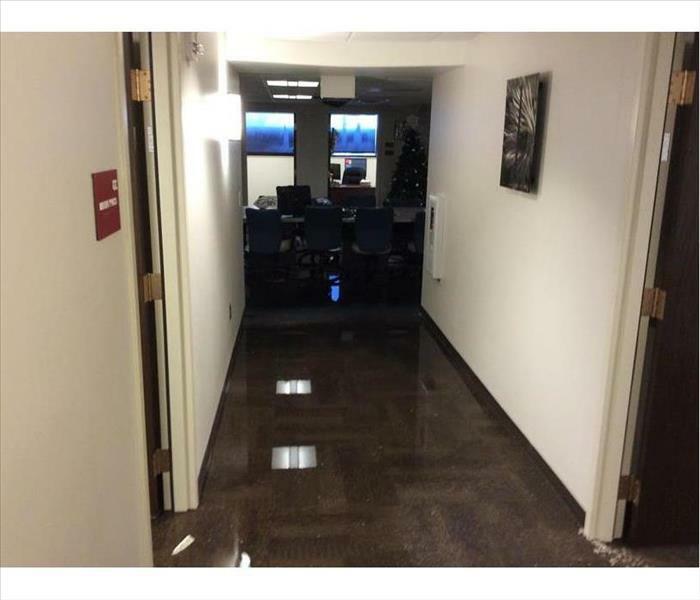 In the above photo, water pooled in the hallway. Our techs used our air movers and dehumidifiers to target the moisture before mold and other damage set in. 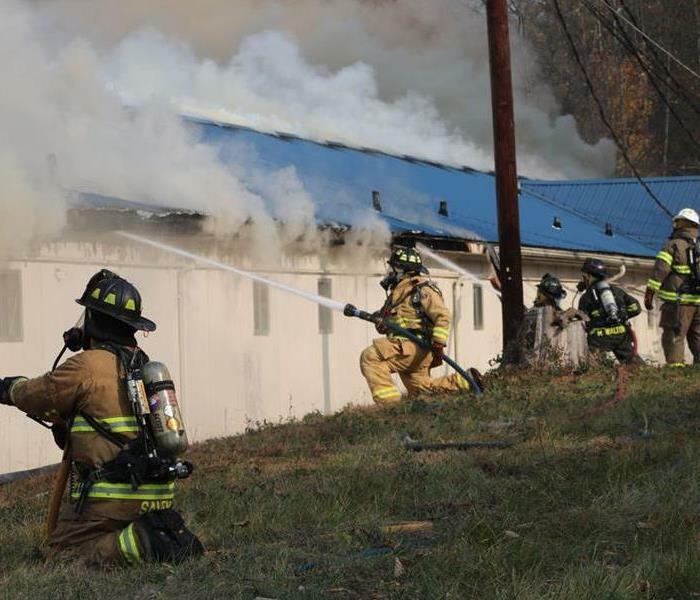 When a fire damaged an old school building and the neighboring town hall in Hildebran, NC, our crews were quick to respond. We used this duct-cleaning equipment to clear out the dust, soot, and other residue that the fire created. When a commercial building in Valdese, NC, had a fire, they called SERVPRO. 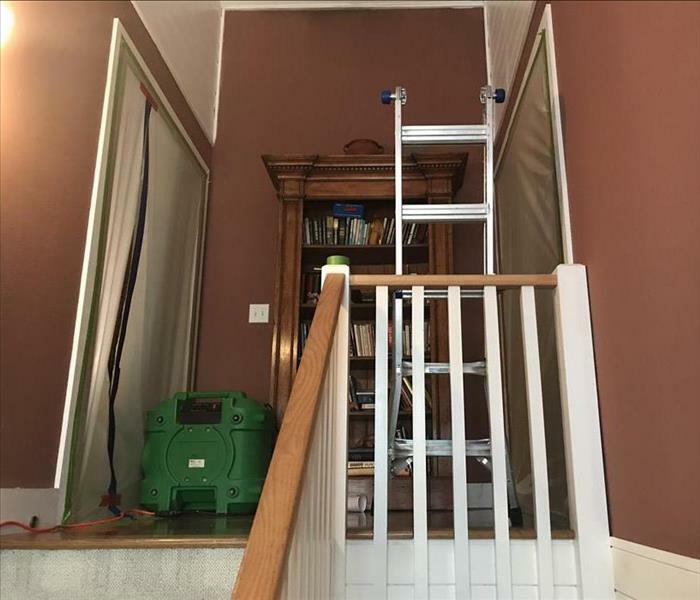 Our technicians conducted a thorough duct cleaning, deodorized multiple rooms, and used proprietary cleaning solutions to scrub the stained floors and walls. In the end, it looked "Like it never even happened." 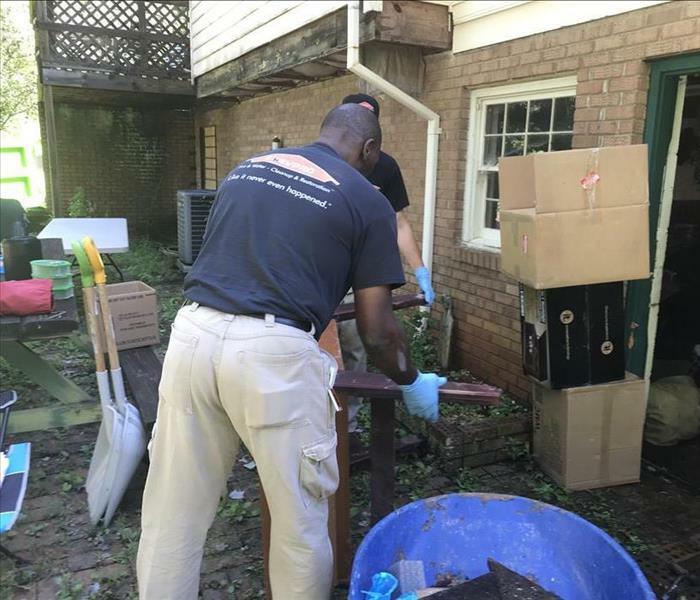 When we visited a mold-infested home in Burke County, we had to set up a containment zone to keep the mold spores from spreading while we removed the existing mold growth. 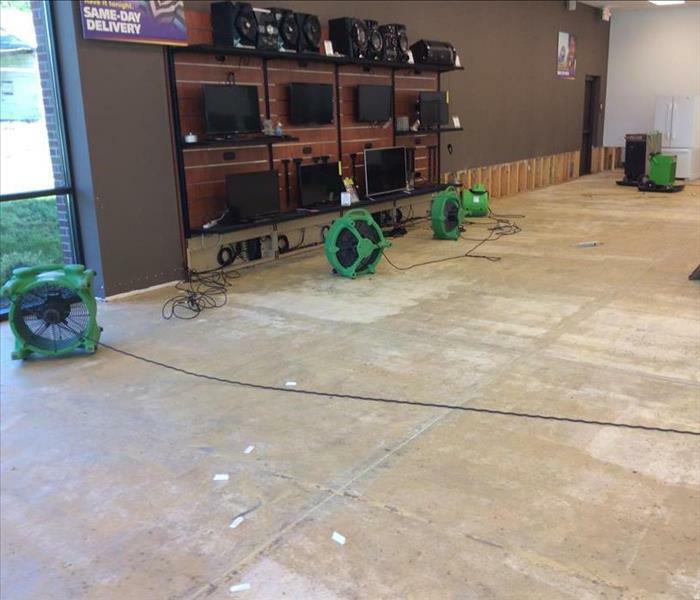 When a local business had severe water damage all throughout its store, SERVPRO was there to help. 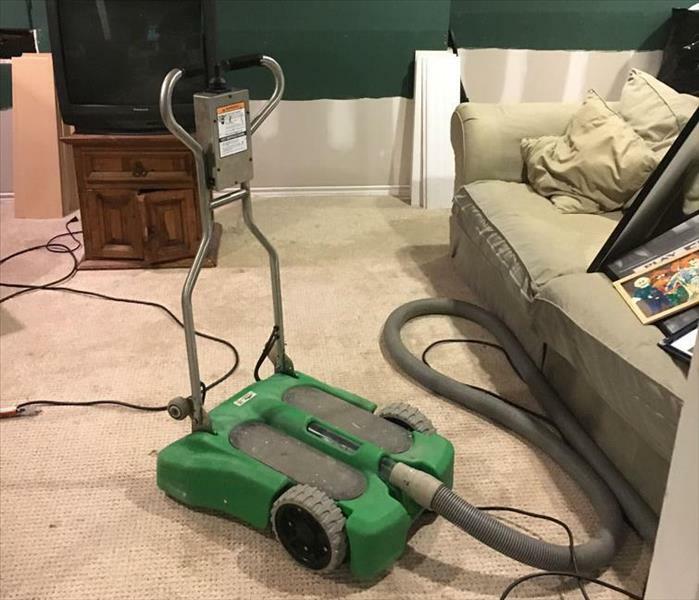 We had to remove the carpet, but before we could replace it, we had to use our air movers, dehumidifiers, and other tools to dry out the affected areas before more damage could occur. There are many ways we can scrub mold off of high ceilings, but in this case, we just used a really long brush! But first, we had to apply an anti-microbial! Groundwater from a storm can adversely affect a basement in Hildebran. Water extraction with pumps is followed by air movers and dehumidifiers to remove the lingering moisture from the concrete floor and the air. 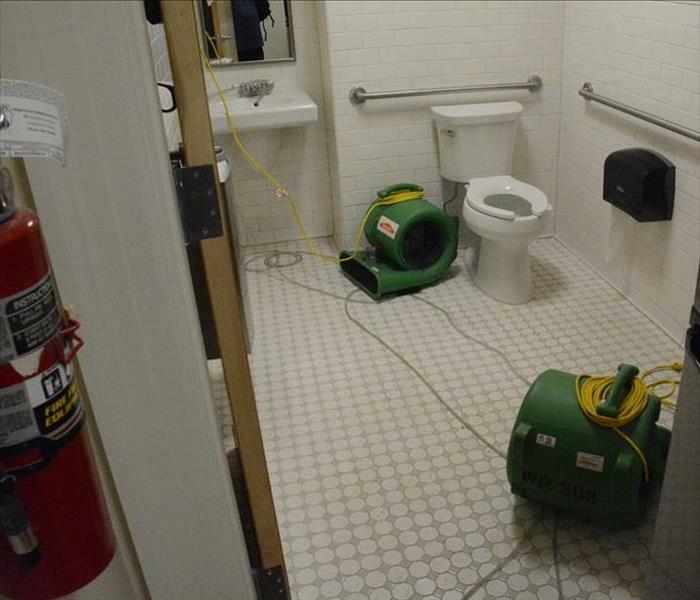 Consider SERVPRO for rapid service to mitigate damages. We are capable of doing so much, that a lot of it goes under the radar. Some of our marketing staff visit insurance agents to talk about what we can do so agents can better inform their customers when disaster strikes! Pictured is a demolished and cleaned ceiling after a water line leak in this Hildebran house. 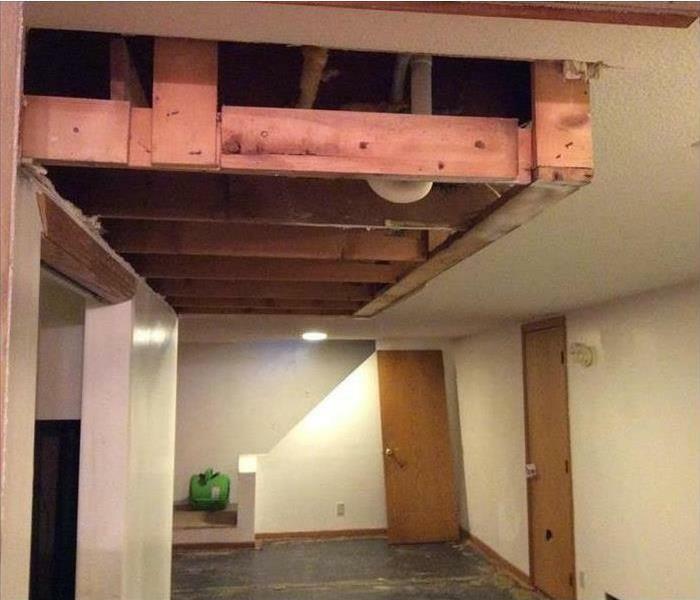 The second-floor bathroom plumbing was the culprit that generated this water damage. SERVPRO has the equipment and skilled technicians to restore this problem. The supply water line to the sink in the restroom sprung a leak that flowed throughout the night. The pooling water was rapidly removed from the carpeting as the furnishings were moved around to reduce the chance of water damage. 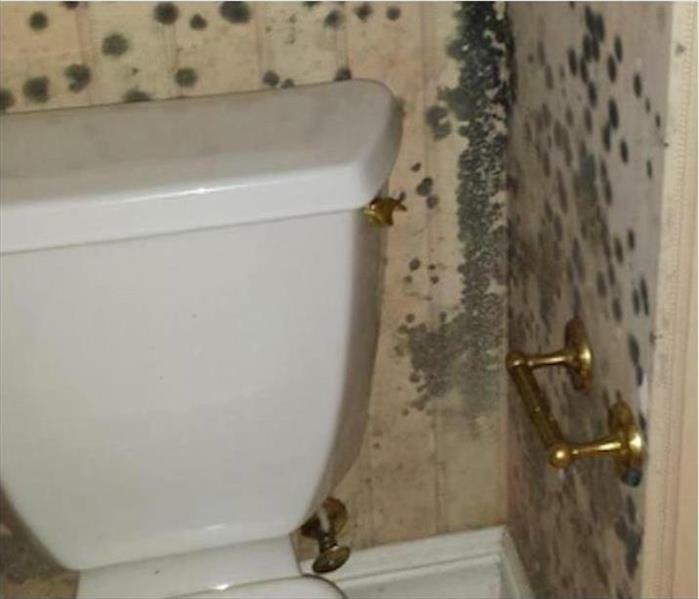 When moisture builds up in a Valdese bathroom because of lack of ventilation, the invitation extended to mold growth, is big. The spores grow into patches feeding on the paste and drywall. These walls require removal, antimicrobial application, and replacement. Storm damage in Morganton could come in epic proportions. A SERVPRO Disaster Response Team is at the ready standing by awaiting a call. 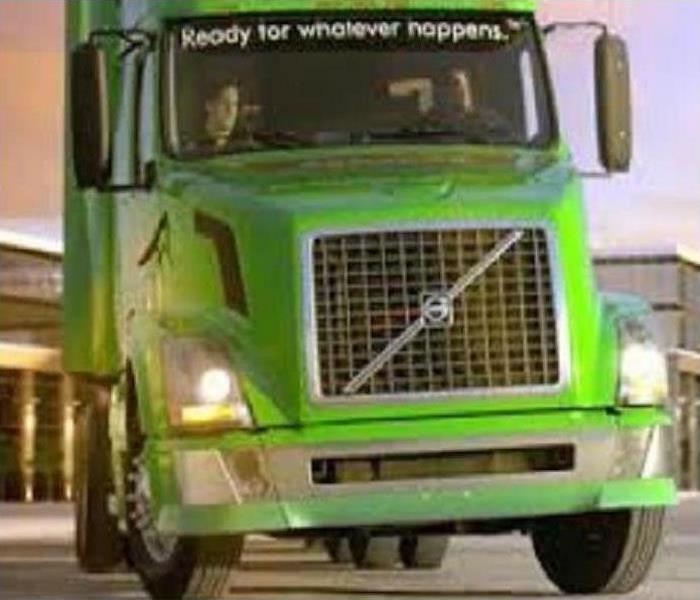 There are semi-tractor trailer trucks loaded with storm remediation equipment ready to roll at a moment’s notice. When pressure is needed to help extract water from a saturated carpet in a Valdese home, mounting and riding a "Rover" increases the efficiency. This piece of SERVPRO equipment reduces the chance of secondary water damage. 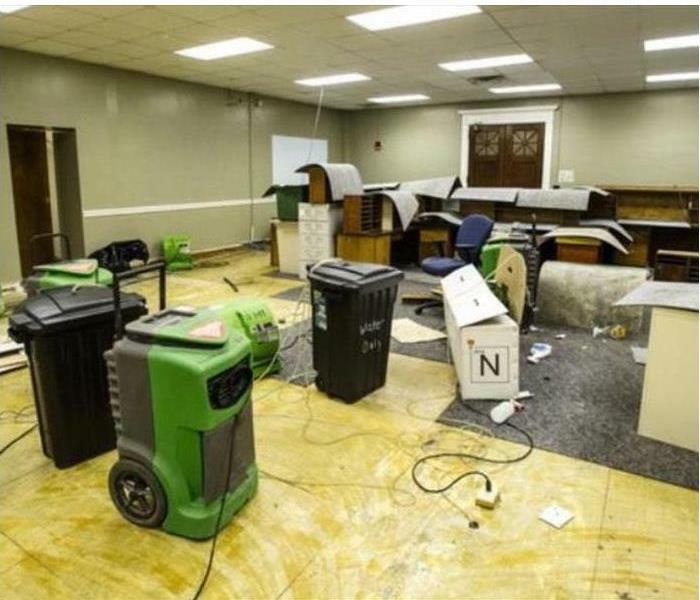 The ruptured water line damaged the commercial carpeting and some of the furnishings in this Morganton Office. SERVPRO devices are hard at work removing the remaining moisture and humidity. Rapid service does mitigate the damage, though it was damaging in this case. Fire damage to this Conover home was extensive. Several windows had been blown out by the heat of the fire. SERVPRO was called in top provide board up services prior to also providing the overall fire damage restoration project at hand. 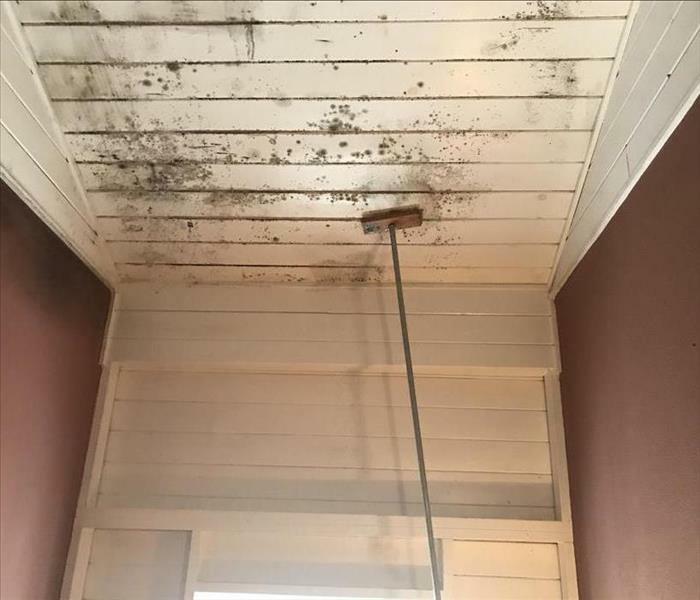 Mold damage at this Morganton house began in a very typical fashion. It began with a minor leak in a window of the home. 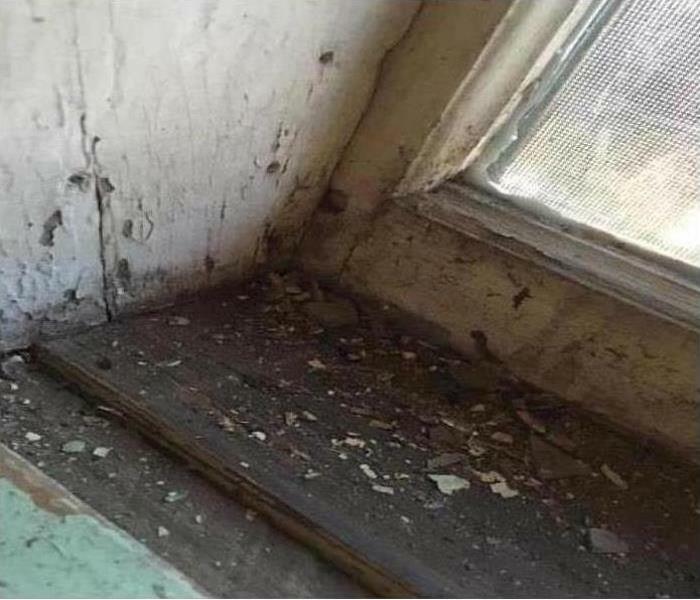 This is a prime example of how a small source of moisture eventually leads to mold growth. Storm damage to this Valdese home left standing water on the hardwood flooring. 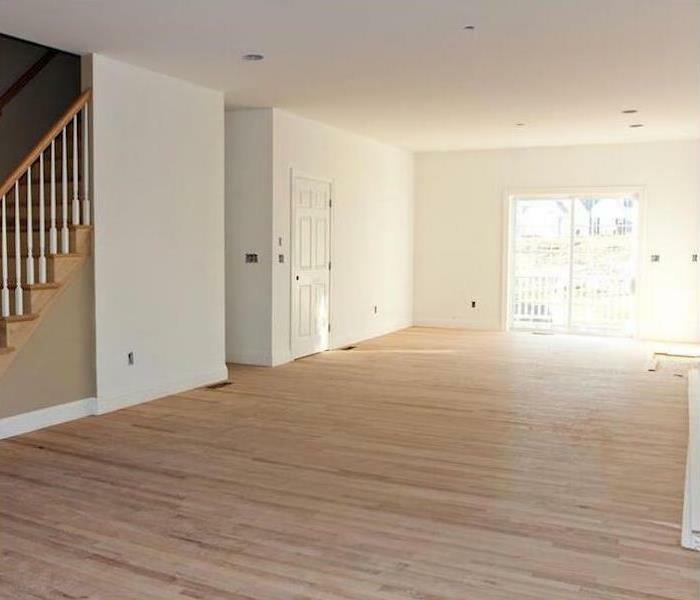 The photo shows the warping that occurs when standing water is left for too much time on hardwood flooring. 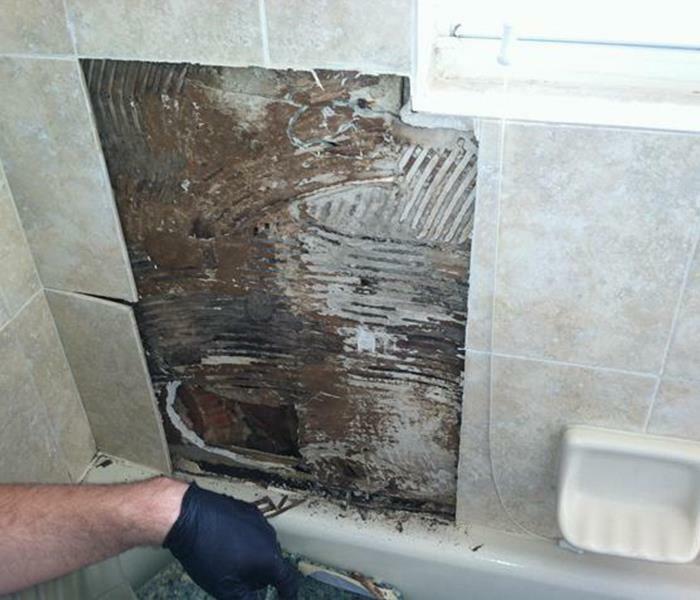 SERVPRO of Burke County has various methods to remediate damage such as this. Water damage at this Morganton home had warped the hardwood flooring in the room pictured. SERVPRO of Burke County has the latest tools and technology available to restore hardwood flooring that has been damaged by water. The technology has come a long way. We were able to restore the majority of the floor pictured above. 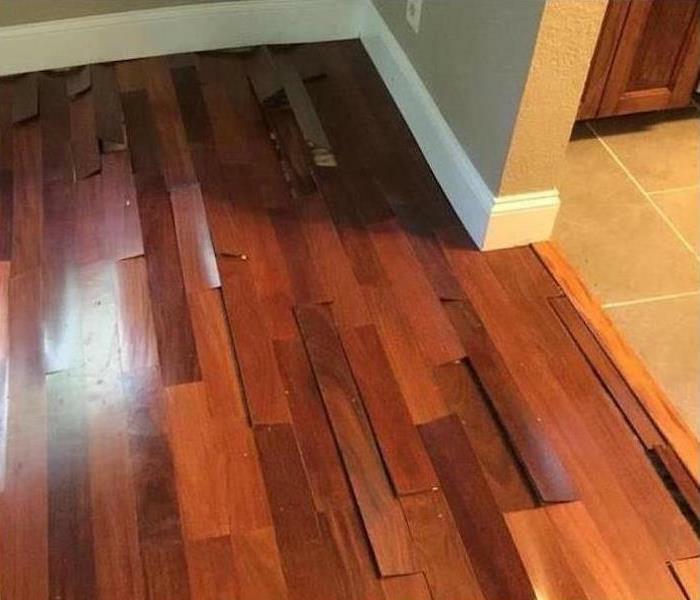 Just a couple of small sections needed to be matched and replaced. 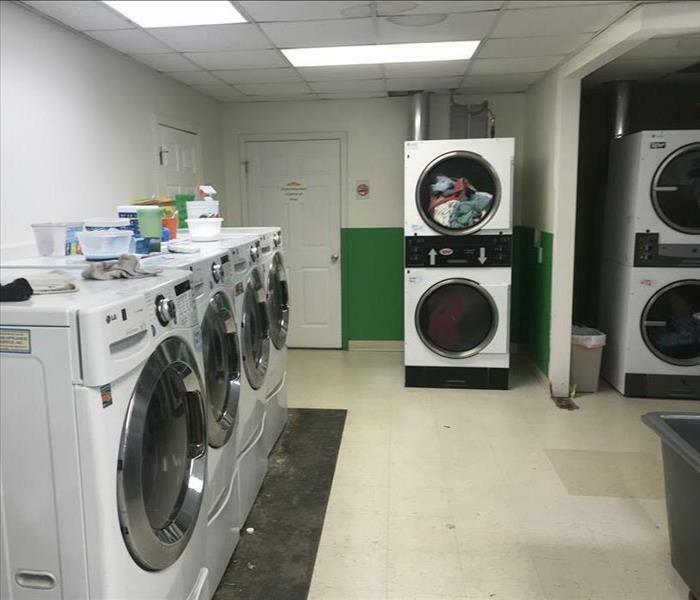 Commercial water damage at this Morganton retail store resulted when the automatic sprinkler system accidently activated during the night. 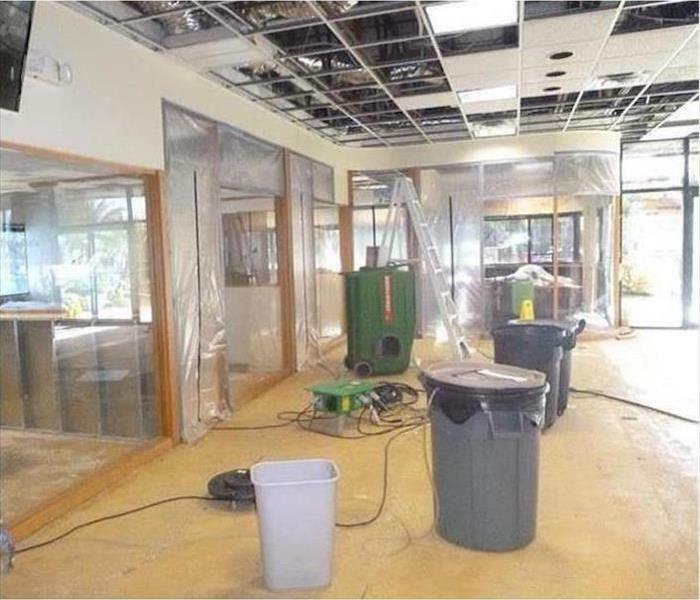 The ceiling tiles were destroyed, and there was a lot of standing water on the floor. SERVPRO was called to clean up the water and remediate the damages. We began extracting and pumping the water out of the facility. At the same time, we were removing the contents of the store for transport to our warehouse for drying and restoration. We cleaned up the ceiling tiles and then began the drying phase by placing commercial air movers and dehumidifiers in the store. When all was dry, we returned the contents, most of which were favorably restored, to the store. Mold damage at this Morganton home was treated with dry ice blasting. 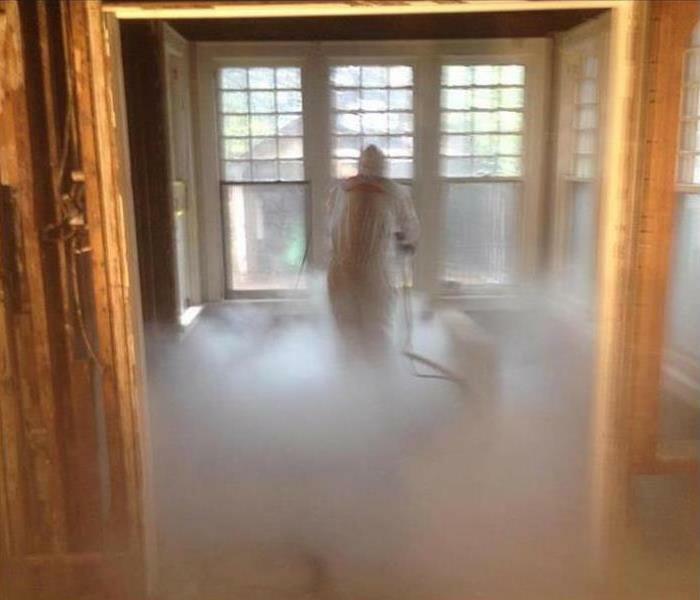 Dry ice blasting is more environmentally friendly than alternative methods of mold remediation. It is also faster and more economical. The preliminary cause of a massive fire that destroyed the Economy Inn in Morganton originated in an electrical room on the southwest side of the motel. Officials are still unable to determine an exact cause, but they know that it was an accidental fire and there was no malicious intent. 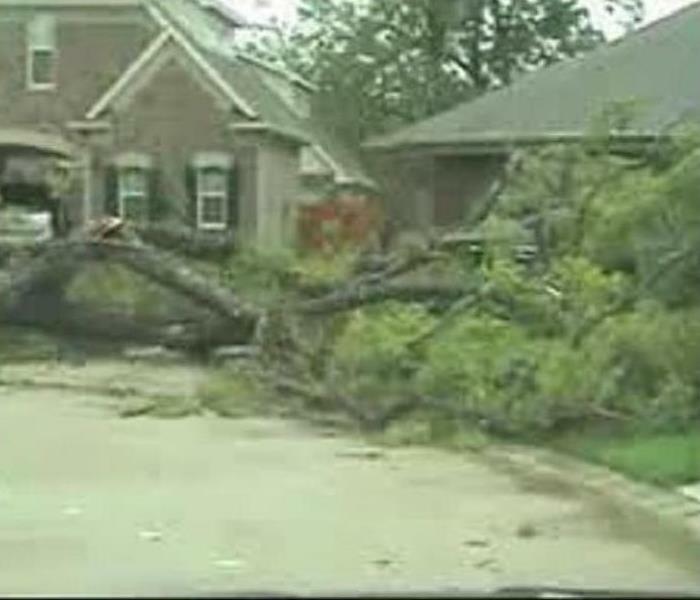 Damages have been estimated to be $375,000 in property damage and $100,000 in content damage. 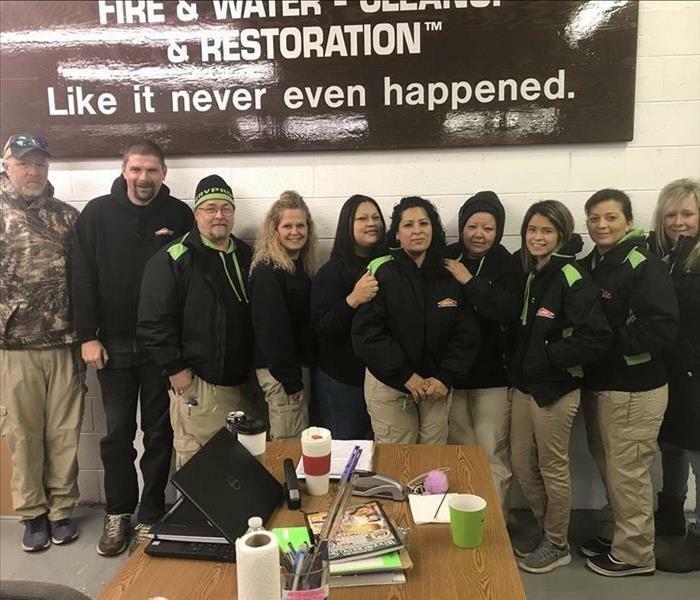 SERVPRO of Burke County in Morganton came to the restaurant to clean the smoke and fire damage and the restaurant reopened for service the Monday after the fire. 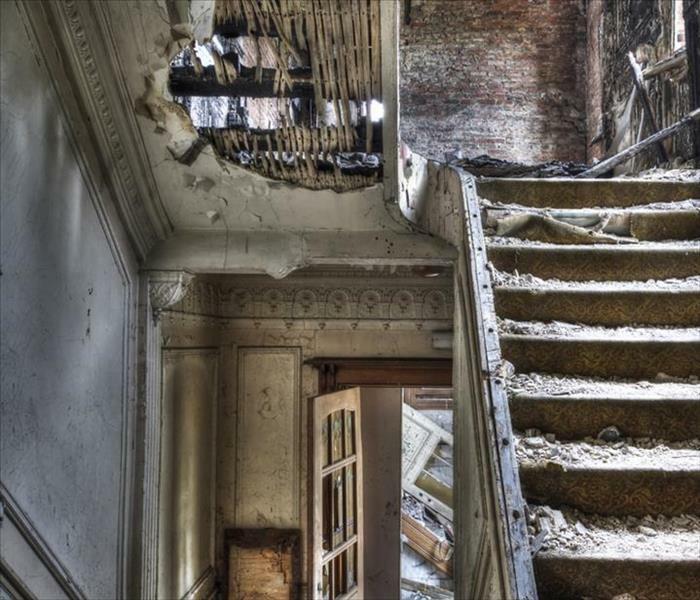 Fire damage can be devastating for a commercial property or business. Every hour spent restoring your business back to pre-fire condition is an hour of lost revenue and productivity. If your Burke County area business experiences a fire loss, call us first for a fast response. Photo courtesy of … News Herald file photo. Wildfires have been raging throughout our area threatening both property, livestock, and lives. Just in South Mountain State Park over 300 acres are burning. 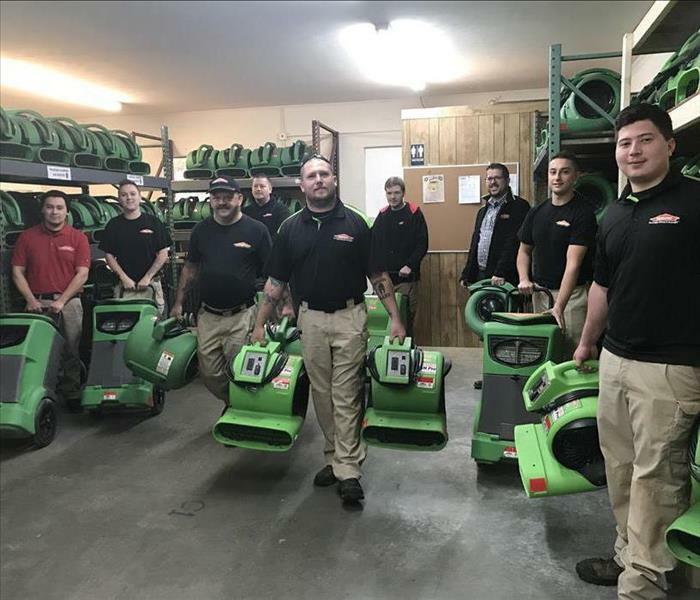 Our group of SERVPRO franchises stands at the ready to assist our customers and neighbors for any impending fire damage related to these wildfires. Storm damage that blew through Valdese tore roofs off homes and knocked down tree limbs and in this case entire trees. SERVPRO provided water damage restoration services to many residents in addition to removing fallen debris such as the tree pictured here. If storm damage impacts your home or commercial facility, call SERVPRO of Burke County 24/7 at (828) 874-0966. We proudly offer 24-hour emergency service, and we are equipped to deal with any size disaster. The sink was intentionally stopped up and the water was left running. Though the tile flooring contained the spillage, the wooden door, trim and some walling material were water damaged. We suctioned out the pooling water and used several air movers to dissipate the residual moisture while not disrupting regular retail business at this Hildebran shop. Water damage in Morganton requires water damage cleanup followed by a drying process. Infrared cameras are used to identify exactly where water damage is located. 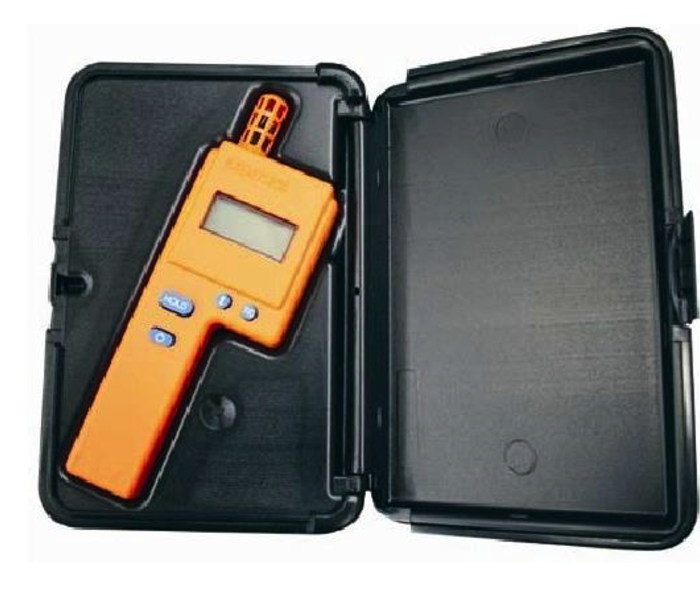 Hygrometers are one of the instruments used to measure humidity and the amount of moisture saturation. This aids in defining the extent of the damage and helps determine when the drying phase is completed. If your property experiences water damage and you are seeking the latest methods and equipment, call SERVPRO of Burke County 24/7 at (828) 874-0966. 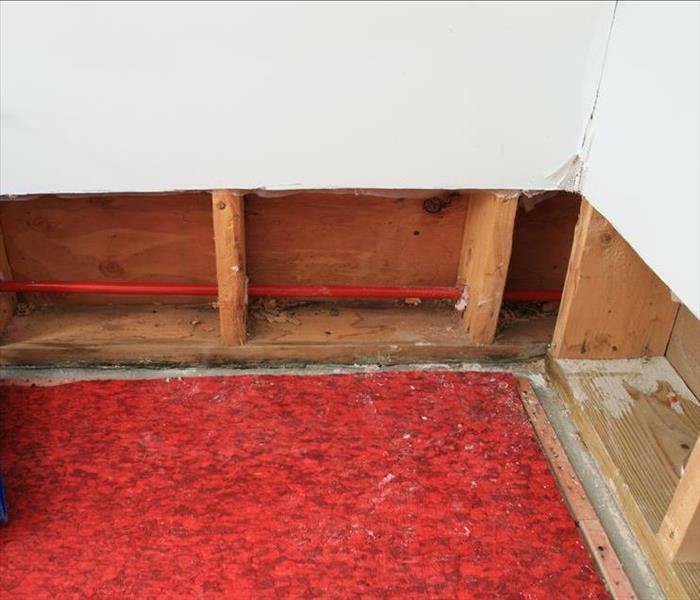 Mold damage appeared in this Hildebrand home’s bathroom along the baseboard. Inspection with SERVPRO’s thermal imaging device revealed the presence of moisture and mold behind the wall tile. The bathroom was sealed from the remainder of the home prior to the start of mold remediation so mold spores could not drift freely through the residence. We removed the tile, found the source of the moisture, and repaired a supply line leak. Drying of the affected area and application of an anti-microbial agent was completed. New tile was installed to complete the project. If mold is detected in your home, call SERVPRO of Burke County 24/7 at (828) 874-0966. When this water line inside a wall sprung a leak in this Morgantown home there was no place for the water to go except inside the cavilty of the wall. It eventually wicked through the drywall and blisterd the paint. The homeowner then called SERVPRO of Burke County to fix the problem. If your fire damaged home looks like this you should be calling SERVPRO to do the cleanup and the restoration. If fire damage occurs in your Lake James home, call SERVPRO of Burke County 24/7 at (828) 874-0966. When the storm finally subsided if had left a layer of standing water on the concrete pad of this Valdese garage. 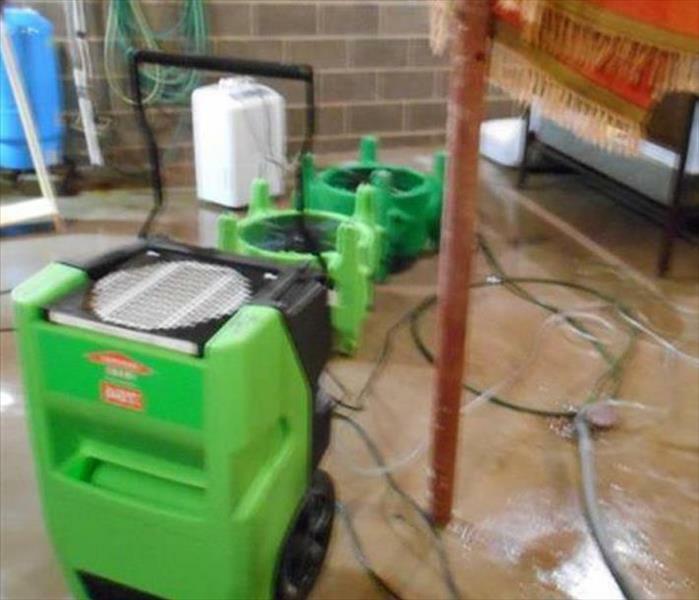 SERVPRO pumped out the standing water and then set up this equipment to finish the job.